Adapted in part from open sources. How did Maya people change their physical appearance? In what ways do people in your own society modify and alter their bodies (or those of their children) in the name of beauty, custom, or fashion? Modified Maya skull, Museo Regional de Antropología, Palacio Canton, Mérida, Yucatán. After a Maya mother in the Yucatan gave birth, she washed her infant and then immediately compressed her child’s head between two boards on the front and back. After two days of this treatment, the child’s head was permanently flattened – mark of beauty to the Maya, as were crossed eyes (parents also took steps to encourage this). The child was then taken to a priest, who prophesied his or her destiny and assigned the child a named based on their date of birth. Such was a typical welcome into the Maya world. At a certain age, boys typically moved away from their family and lived in a special communal house where they were taught the arts of war and hunting. For fun, they likely gambled or played the ball game. Basic components of everyday dress included a loincloth or short skirt for men and a huipil or long skirt (perhaps paired with a quechquemitl) for women. These outfits would often be embellished with jewelry such as bracelets and anklets, necklaces, and ear jewelry. Girls were brought up in the household by mothers. While teenage boys in their communal homes would reportedly enjoy visits from prostitutes, teen girls were expected to remain chaste. Beyond child-rearing, women played a vital role in society by cooking food both for consumption and sacrifice. As in so many ancient societies, marriage was arranged across clans and lineages for the benefit of family alliances and social mobility. Adultery was punishable by death. 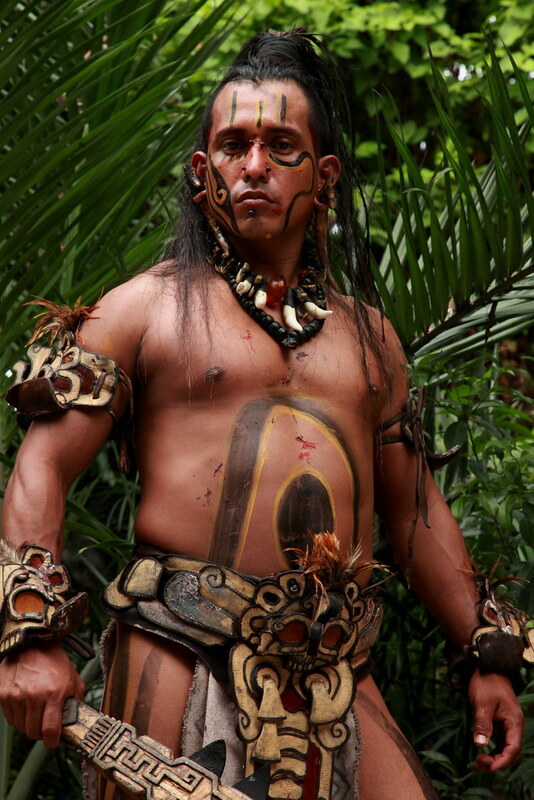 A Maya man recreates his ancestor’s warrior garb in Xcaret, Mexico. Both men and women filed their teeth in differing patterns, and some skulls of elite individuals have been found with “grills” of jade, the way some modern rappers inlay diamonds and gold. Until marriage, men painted themselves black, and after marriage, both men and women covered their bodies from waist up in elaborate permanent tattoos. The Maya did not believe that their dead immediately went on to any specific paradise or afterlife. Instead, common people were buried with their modest possessions beneath the floors of their family homes, their mouths filled with food and jade beads. These dead ancestors were considered by the living as spiritual protectors – intercessors in the realm of the gods – and were venerated accordingly. Is Maya rule a patriarchy or a matriarchy? How does this compare to your own society? In what ways did kings and the Maya elite set themselves apart from commoners? Are there any similar signifiers in your own society? A commoner kneels before his king in this mural discovered in modern day Guatemala. Classic Maya rule was centered in a royal culture that was displayed in all areas of Classic Maya art. The king was the supreme ruler and held a semi-divine status that made him the mediator between the mortal realm and that of the gods. From very early times, kings were specifically identified with the young maize god, whose gift of maize was the basis of Mesoamerican civilization. Maya royal succession was patrilineal, and royal power only passed to queens when doing otherwise would result in the extinction of the dynasty. Typically, power was passed to the eldest son, and the royal heir was called b’aah ch’ok (“head youth”). King Itzamnaaj B’alam II, adorned with the customary Maya headband, headdress, and scepter, is easily distinguished from his wife. Various points in the young prince’s childhood were marked by ritual; the most important was a bloodletting ceremony at age five or six years. Although being of the royal bloodline was of utmost importance, the heir also had to be a successful war leader, as demonstrated by taking of captives. The enthronement of a new king was a highly elaborate ceremony, involving a series of separate acts that included enthronement upon a jaguar-skin cushion, human sacrifice, and receiving the symbols of royal power, such as a headband bearing a jade representation of the so-called “jester god“, an elaborate headdress adorned with quetzal feathers, and a scepter representing the god K’awiil. From the early Preclassic, Maya society was sharply divided between the elite and commoners. Commoners are estimated to have comprised over 90% of the population, but relatively little is known about them. Their houses were generally constructed from perishable materials, and their remains have left little trace in the archaeological record. The range of commoners was broad; it consisted of everyone not of noble birth, and therefore included everyone from the poorest farmers to wealthy craftsmen and commoners appointed to bureaucratic positions. Commoners engaged in essential production activities, including that of products destined for use by the elite, such as cotton and cacao, as well as subsistence crops for their own use, and utilitarian items such as ceramics and stone tools. Commoners took part in warfare, and could advance socially by proving themselves as outstanding warriors. 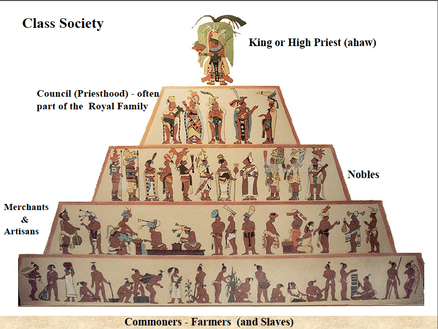 Commoners paid taxes to the elite in the form of staple goods such as maize flour and game. It is likely that hard-working commoners who displayed exceptional skills and initiative could become influential members of Maya society. What was the Maya diet like? What goods did the Maya export? How was this trade important to the stability and prosperity of their kingdoms? Why would salt have been not just a luxury but a vital commodity in ancient times? What goods do your own state and country export? The basic staples of the Maya diet were maize, beans, and squashes. These were supplemented with a wide variety of other plants either cultivated in gardens or gathered in the forest. At Joya de Cerén, a volcanic eruption preserved a record of foodstuffs stored in Maya homes, among them were chilies and tomatoes. Cotton seeds were in the process of being ground, perhaps to produce cooking oil. Ceramic bowl depicting a Maya commoner with tamales as offerings for the gods. Maize would have likely been ground into flour and baked into tortillas. It may also have been turned into a gruel called saka’, flavored with chili pepper, and eaten for breakfast. As k’eyen, maize was mixed with water and sour dough and carried in hollowed-out gourds to the fields for lunch. Based on painted ceramics, we know that the ancient Maya also ate tamales, which they called keehel wah. Every Maya household had its own kitchen garden in which vegetables and fruit trees were raised for family consumption. Archaeologists have found evidence that these gardens contained papaya, avocado, apples, sapodilla, and breadnut trees. The Maya had few domestic animals; dogs were domesticated by 3000 BC, and the Muscovy duck by the Late Postclassic. Ocellated turkeys were unsuitable for domestication, but were rounded up in the wild and penned for fattening. All of these were used as food animals; dogs were additionally used for hunting. It is possible that deer were also penned and fattened. For common people, these meats would most likely have been eaten in a stew flavored with squash, squash seeds, and peppers. As is still common today, Maya farmers raised native stingless bees, which were kept in small, hollow logs closed with mud plaster at either end. Chocolate beverages were popular among the ancient Mayas, who used special recipients to serve it. They often consumed it cold, hot, or spiced with chili, annatto, or vanilla. The inscription on this vessel records its function for drinking a specific type of cacao, and the name and place of residence of its owner, Tzakal u K’ahk’ Hutal Ek’, lord of Acanceh. In addition to basic foodstuffs, the Maya also cultivated prestige crops such as cotton, cacao, and vanilla. Cacao was especially prized by the elite, who consumed chocolate beverages. The Spanish report that cacao beans were used as currency in the Maya realm. Cotton was spun, dyed, and woven into valuable textiles, also in order to be traded. In fact, these cash crops, alongside a strong trade in sea salt, were of prime importance to the Yucatan in particular. These goods were traded north to via canoe along the Gulf coast (since roads were poor and no pack animals were available in this part of the world) first to civilizations like Teotihuacan, and later to their cultural heirs, the Mexica (better known as the Aztec). In fact, it is likely that this robust trade is what kept the Mexica from actively conquering the Maya, as they did so many other neighboring, if less cooperative civilizations – they could not risk disrupting this prized trade. Trade routes in the northern Maya world. Use this dictionary to write a short poem in the Maya script, using at least a dozen glyphs. Does composing in Mayan effect the experience of writing and reading? The Popol Vuh is one of the few remaining Maya stories dating to before the Spanish conquest. It was originally preserved through oral tradition throughout the Maya world until approximately 1550 when it was written down. The Popol Vuh includes the Mayan creation myth, beginning with the exploits of the Hero Twins Hunahpú and Xbalanqué. Read some of an English translation of the Popol Vuh, then choose a scene to reenact in a 3-5 minute skit or video in front of your class. Write an essay that compares and contrasts the 16th century Spanish conquistadors and the 21st century Taliban. Research the Caste War of Yucatán, which occurred in Mexico’s Yucatan Peninsula in the nineteenth century. 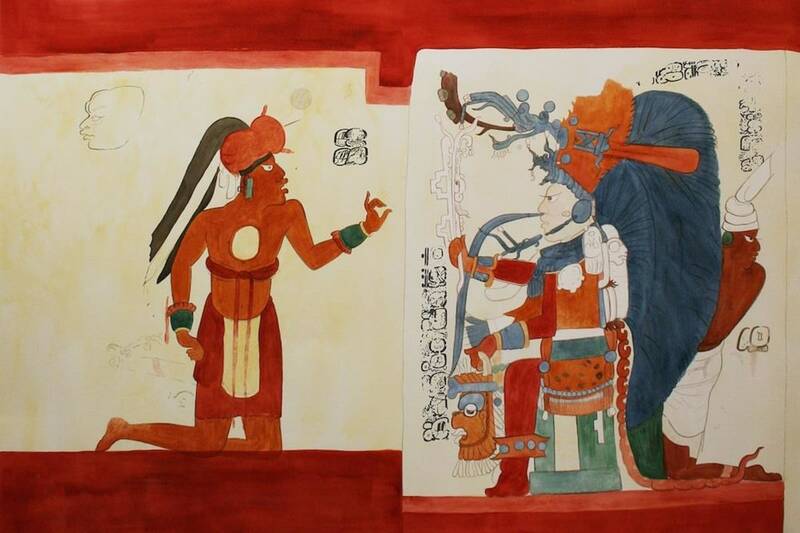 Take inspiration from the form and style of the Dresden Codex to tell the story of this late period Maya resistance. Choose any section from this unit and develop a lesson – in the form of a presentation, a storybook, or a worksheet – that teaches younger students about the Maya. Make sure the material is age appropriate in content and approach, and create some simple questions to check your audience’s understanding. The Maya (People and Places) by Michael Coe. Ancient Maya by Barbara Somervill. 1491: New Revelations of the Americas Before Columbus by Charles C. Mann. THIS LESSON WAS INDEPENDENTLY FINANCED BY OPENENDEDSOCIALSTUDIES.ORG. If you value the free resources we offer, please consider making a modest contribution to keep this site going and growing. A Guided Tour of Maya Mexico, 2017 – Explore the ruins of Ek’ Balam, Uxmal, and Chichen Itza, scramble through streets of colonial Merida, and sample the cuisine and culture of Mexico’s Yucatan Peninsula. Supplementary photos and information on the Yucatan, past and present. Who should replace Andrew Jackson on the $20 bill?